Late last year, I started a series on my blog called One Day in Dublin. It's designed to show readers what you can do in a day in a Dublin neighborhood, but it's also an excuse to explore and discover my adopted city with a few girlfriends and a lot of stops for tea and treats! I'd love to be able to illustrate my One Day in Dublin posts with a sweet little map, just to make it easier for readers to visualize. And I'm really excited to dust off my notebook and pens and get drawing and creating again. I envision the map being a little functional but a lot more about the illustration. The final project will be digital, but I'll be doing it on paper and hopefully figuring out how to get it online. 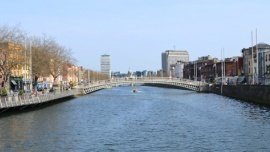 I want to include just enough detail so that visitors to Dublin can a lovely day in my city without getting lost! That said, I'm a little worried that my artistic and computer skills won't match my vision. Fingers crossed!